To change the size (re-size)the desktop clock please restart the aero desktop clock, use the slider to re-size the aero desktop clock window. Move to the left to make the clock smaller or to the right to make the desktop clock bigger (... see Image-1 Arrow-1) ! Please use the latest version of the aero clock: ... TheAeroClock! Please if possible use always: ... the latest version of the Aero Desktop Clock for Windows! 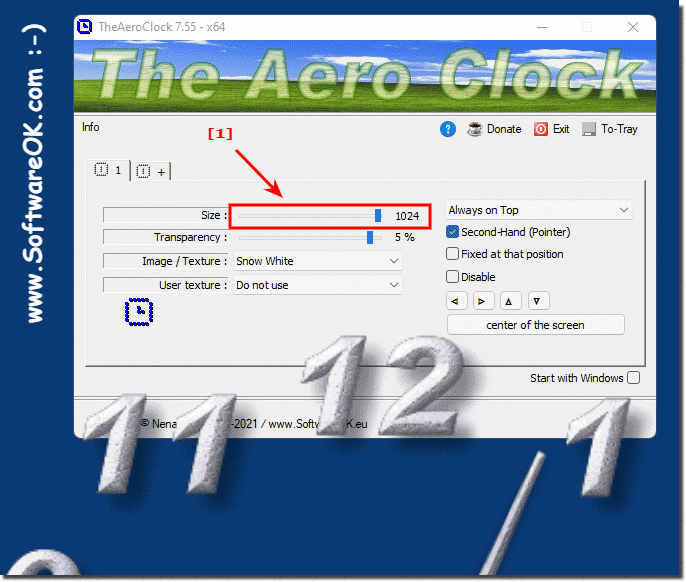 TheAeroClock - FAQ-3: Can i change the size of the desktop clock (windows, resize)? Resize the sice of the desktop clock gadget? Change the window size of the desktop clock?